Displaced Yemeni children living in school corridors in Amran governorate where schools hosting IDPs are already filled to capacity. 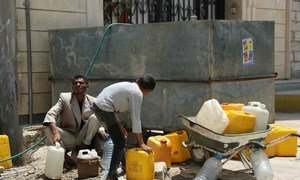 The conflict in Yemen has forcibly displaced more than 2.4 million people and the situation is likely to worsen, the United Nations refugee agency today reported, calling for humanitarian access to the hardest-hit areas in the country. “The situation is likely to get worse, amid increasingly dire humanitarian and socio-economic conditions and with no political settlement in sight,” Mr. Dobbs added in reference to the fighting that has been underway for nearly one year. The Task Force on Population Movement, led jointly by UNHCR and the International Organization for Migration (IOM) as part of the humanitarian response to the crisis, released a reportestimating the number of internally displaced persons (IDPs) in Yemen at around 2,430,178. This figure is slightly down from the 2.5 million reported by the Task Force in December, but the difference masks “the human face of the conflict and the continuing suffering and growing needs,” according to the spokesperson. The report shows increased levels of displacement in areas where the conflict has escalated, notably in the governorates of Taiz, Hajjah, Sana’a, Amran, and Sa’ada, which together account for 68 per cent of all IDPs in Yemen. UNHCR and IOM have called for ensuring access for deliveries of essential services. “At the very least we implore all sides to allow humanitarian access to the hardest-hit areas, where most of the displaced are located,” Mr. Dobbs said. In January and February, some shipments of food and other life-saving aid were able to be delivered to the central Yemeni city of Taiz. Mr. Dobbs said that despite the severely restricted humanitarian access and security constraints, organizations such as UNHCR and IOM and partners, have delivered household items and emergency shelter to more than 740,000 IDPs. The needs are exhausting, according to the report. While most people seek shelter with relatives and friends, in schools, public or abandoned buildings, many live in makeshift shelters, or out in the open, with little or no protection. The Yemen Humanitarian Response Plan, launched in Geneva last month, seeks $1.8 billion for more than 100 humanitarian partners to provide critical and life-saving assistance to 13.6 million people in need. The Plan is currently just 2 per cent funded.